UP AGAINST THE WALL is a project by Art Forces (www.artforces.org), which is an art/activism/research initiative which investigates intersections of trauma, precarity, memory, borders, resilience, resistance and creativity using multimedia mural arts and interdisciplinary action research. UP AGAINST THE WALL is led by Susan Greene, Director of Art Forces and a practicing psychologist/artist, in collaboration with a large network of artists, photojournalists, community members, organizations and documentarians. Art Forces expands muralism through media education strategies, clinical responses to trauma, connections to wide range of international community organizing partners, and a cinematic approach to the visual image based on montage theory and a more recent heritage of San Francisco Bay Area bricolage and tactical aesthetics. These multimedia/interactive platforms expand the murals’ themes, making context, hidden histories, and narratives easily accessible; connecting participants and viewers across seemingly great distances and concerns. Art Forces investigates the (im)possibility of understanding trauma associated with ongoing conflict, displacement and precarity, meaning that the refusal to understand trauma can be an ethical and creative act. Claude Lanzman, who made the film Shoah, suggests that what is created in such conditions does not grow out of a knowledge already accumulated but is intricately bound up with the act of listening itself (1995). As Cathy Caruth writes: “For the survivor of trauma, then, the truth of the event may reside not only in its brutal facts, but also in the way that their occurrence defies simple comprehension” (Caruth,1995). Caruth goes on to say that the impossibility of a comprehensible story, however, does not necessarily mean the denial of a transmissible truth. It requires that one take the impossibility as the starting point, refusing a certain framework of understanding (1995). Providing direct audio and visual access to personal stories as well as continued visual inspiration through the public interface of public community murals; the projects move from the local to the global. The site specificity of the mural sites allows for intense community engagement, while the documentary audio and visual materials provide necessary context and support to interpret not just the murals themselves, but the larger psycho-socio-political dynamics and forces. The media components allow the site-specific murals’ themes to be amplified to a global audience. Action Research is defined as a problem focused, context specific and future oriented investigation that describes and interprets social situations while implementing interventions with the goal of improvement and involvement of participants. Action Research is a group activity based upon on a partnership between action researchers and participants – all who are involved in the change process and are part of what is being researched (Waterman, Tillen, Dickson, de Koning, 2001). Action Research…aims to contribute both to the practical concerns of people in an immediate problematic situation and to further the goals of social science simultaneously. Thus, there is a dual commitment in action research to study a system and concurrently to collaborate with members of the system in changing it in what is together regarded as a desirable direction. Accomplishing this twin goal requires the active collaboration of researcher and client, and thus it stresses the importance of co-learning as a primary aspect of the research process (O’Brien, R. (2001). The proposed project will analyze new data in 2015-16 collected in refugee camps in Lebanon, Gaza, the West Bank, East Jerusalem and urban Bay Area, CA; in addition to archival data from past projects in Middle East and USA. In an ongoing process, artists, psychologists, sociologists, and journalists facilitate and participate in creation of site-specific murals, sound, video and photographic documentation of histories, interviews, reflections, observation, etc. Among the cultural/research productions are an online archive openly accessible via the project website, via cellphone at the mural sites, and via social media prompts and invitations. Up Against the Wall seeks to expand global participation in the multimedia aspects of the project in two ways: by partnering with journalists and videographers to publish articles and portfolios in major media outlets; and by actively requesting feedback through the project website and social media to determine the impact of these stories, particularly to ascertain how this impact affects the process of living and coping with trauma associated with ongoing conflict, displacement and precarity. Research questions include: How can artistic practice affect the building of resilience? How do people ‘learn from experience”? What is the process whereby people make sense of the senseless? How can the unthinkable be thought about and/or symbolized? What does it mean to be creative and/or active in dire and catastrophic circumstances? What does it mean to be an artist in these circumstances? Research format will include investigation of ‘digital scholarship’ to present the work in multifaceted way, along with traditional scholarship presentations. For the first-time participant, an engagement with the proposed project begins with a walk past a mural site, an event hosted at the site by the project collaborators, media article highlighting the work or an on-line posting, tweet, Facebook, instagram, etc. Each of these engagements includes a prominently accessible invitation or prompt to call, click, or connect to an audio recording or visual images documenting personal experiences of the participants, from the ‘researched’ to the ‘researcher’. The complex relationship between the ‘researcher’ and ‘researched’ is an integral part of the investigation. For example: the project looks at the role that witnessing and lack thereof plays in trauma. Up Against the Wall proposes to bring narratives of people in refugee camps to a global audience with they can be seen, heard, witnessed and responded to. In the coming year, these experiences will be augmented by a follow-up request for feedback on the experience directly afterwards, and audiences will be provided with resources for staying involved at the end of each interaction. For participants who listen to the stories and view accompanying visual materials, the experience may include the integration of new knowledge and perspectives, a window into the lives of community members who have contributed their stories, and often, the establishment of a personal connection to trauma and/or growth developed through the experience of listening and/or looking and observing others’ narratives. The viewer experiences, in the words of John Berger, ‘another way of seeing’. The feedback process allows for participants to reflect on their experience in a way that is constructive, open and creative. The results for the proposed project will be two-fold, further building the database of participants who voluntarily choose to share their contact information for future events and news, and creating a pool of participant feedback which will anonymously serve as raw data for academic publications and reports on art and trauma and directing attention, once activated, towards action by linking participants with ongoing organizing. At present, the contact list of interested past participants in events and news related to the existing murals and multimedia archive includes hundreds of names and fifteen organizations. This number has grown by approximately 50 each year of the project’s fifteen year existence. The project collaborators project a growth of one hundred and fifty through the coming year’s activities, and the goal for the year’s efforts to gather feedback and responses is to include seventy-five new participants as listeners and responders to audio and visual documentation from communities surrounding the mural sites. To do this, the project aims to work with two to five new journalist partners as well as new partner organizations. As a result, Up Against the Wall will be able to make available to fellow researchers, artists, activists and mental health professionals information learned through its activities; in journal publications, project events, conference presentations, the project website, and social media. 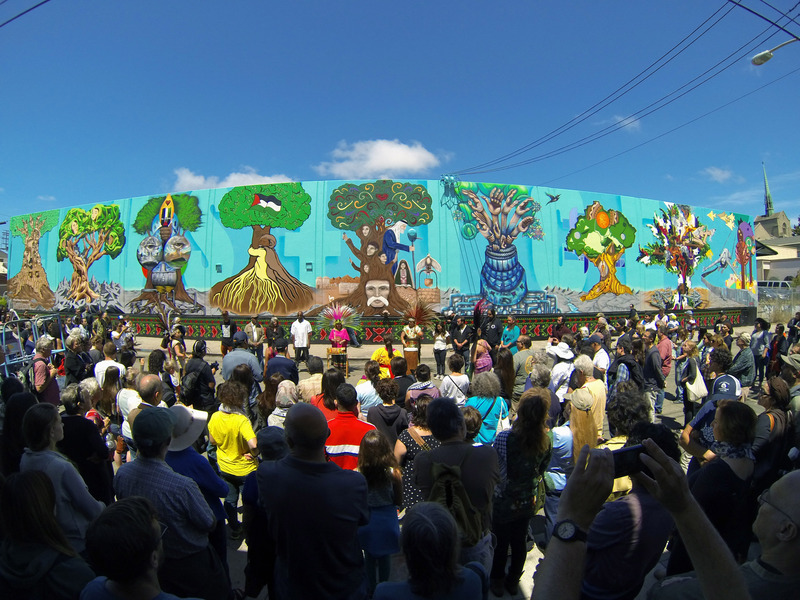 The Oakland Palestine Solidarity Project (OPSP) completed in August 2014, and organized by Art Forces, NorCal Friends of Sabeel and Estria Foundation, includes site specific, new media/technological and event components to create a cross movement building and educational and organizing project. Focusing on the occupation of Palestine the project makes connections between interlinked histories of colonialism, precarity, environmental injustice, racism and exile in multiple global locations. OPSP aims to reveal hidden histories and relationships, including for example, the history of Ohlone Indians of Oakland CA, where OPSP is physically located, and how their story connects to broader global struggles. OPSP creates multiple portals through which people can identify with and enter into the narratives of others, linking seemingly distant locations and disparate issues. OPSP is especially timely given the current crisis in Gaza and ongoing bias of US media coverage. The majority of Americans are not receiving critical reporting placing the issues within a global, historical or relational context. OPSP, given its public location in the new art district of Oakland CA, has possibility of reaching new audiences. OPSP includes a 157 foot by 22 foot international mural in downtown Oakland, CA whose themes are amplified by an interactive website and audio/visual apps accessible by all current technologies and social media. Across the street from the mural is a 7000 square foot space where OPSP and community partners hold meetings, events, art exhibits, film screenings, etc, related to and expanding upon the mural’s themes. OPSP brought together 12 diverse artists, who, using images of trees as a central motif created a stunning public tribute to the resilience and creativity of the human spirit that thrives despite political oppression and injustice, wherever it is taking place in the world. OPSP artists include, Bay Area artists IROT (Native American); Emory Douglas, former minister of culture for Black Panther Party (African American); Chris Gazaleh (Palestinian American); Erin Yoshi, executive director of Estria Foundation (Japanese American); Deadeyes (African American); SPIE (Asian American); Fred Alvarado (Latino American), Miguel Bounce Perez (Chicano-Pacific Islander American) and Susan Greene (Jewish American). Visiting artists were Nidal El Khairy-invited from Jordan (Palestine); VYAL, three time winner of Estria Graffiti Battle (Chicano-Native American/L.A.) 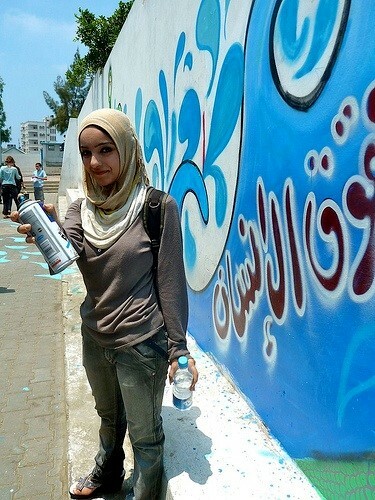 and Dina Matar (participating virtually from Gaza). The current and proposed proposal is to work with web/media developers and engineers to create an interactive website and audio/visual apps and tours that can be downloaded, viewed on line or phoned. A prototype of ‘Call the Wall’ can be heard at 510-269-8333, ext. 11-20. The audio files will include interviews with Palestinians living under occupation, giving personal accounts of their lives and experiences; historical information about Palestine and documentation of current experiences by linking to blog and twitter spheres of the West Bank and Gaza. The video component will include video by Palestinian documentarians living and working in the West Bank and Gaza. The media component of OPSP expands the experience of the site-specific mural providing visitors with contextual information, current events, and historical and personal narratives that otherwise may not be available. Reaching and raising awareness among new audiences about realities on the ground for Palestinians is one of the project’s main goals. OPSP’s multi-media/interdisciplinary and public approach will allow street level access to analysis and personal narratives about Palestine than is available in mainstream media. OPSP will be able to reach people unfamiliar with the issues and facilitate deeper understandings. These will then be followed up with opportunities to concretely become involved through OPSP’s partnerships with grass roots activist organizations including Arab American Resource and Organizing Center and Middle East Children’s Alliance (USA) and EWASH- Emergency Water Sanitation and Hygiene (Palestine). international mural and media project that aims to use art to organize action around environmental justice. The fulcrum of the project is the water crisis in Gaza, Palestine and its connections to global water issues. The MAIA Mural Brigade uses a collaborative community based process to design and execute the murals. 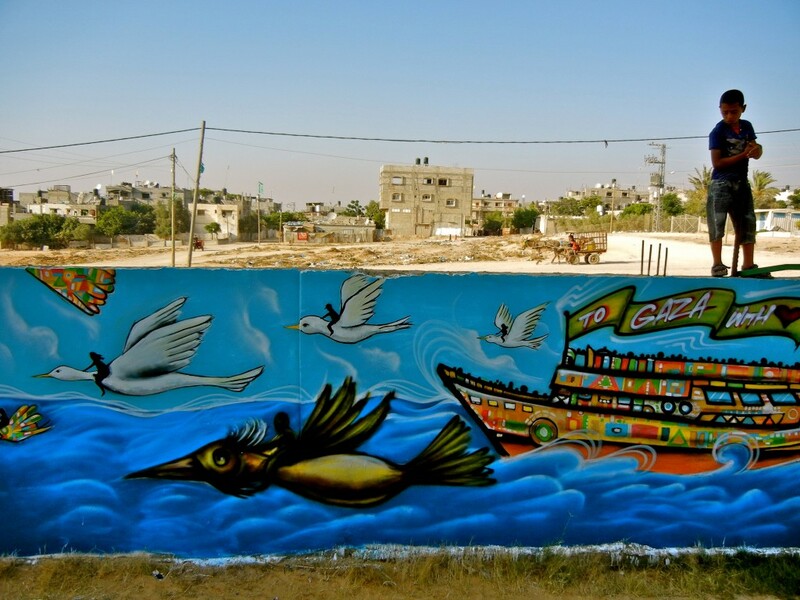 To date, nine murals have been completed in towns and refugee camps across Gaza. 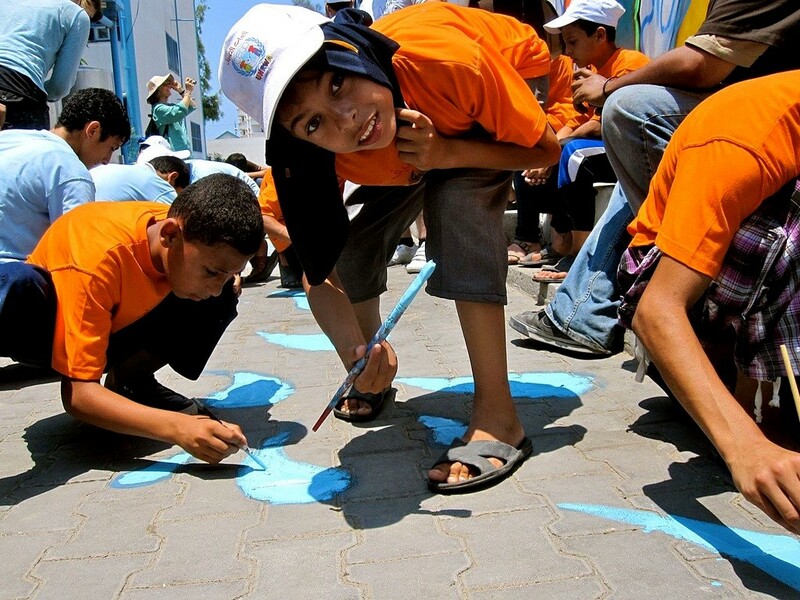 Eight of the murals were completed in 2011 with Estria Foundation’s #Water Writes Project. 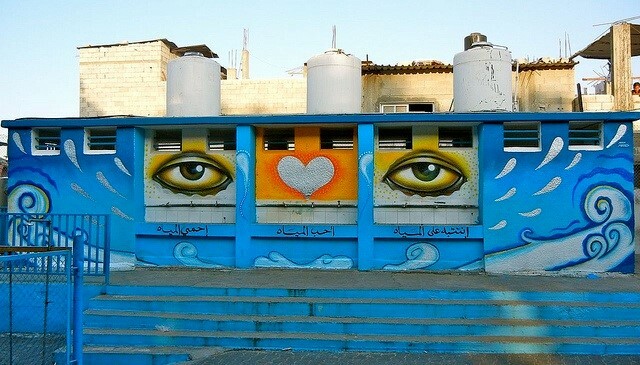 The murals are located at the sites of water purification units being installed by the Middle East Children’s Alliance’ MAIA Project. MECA’s Maia Project is providing clean water to more than 50,000 children and their families. The last mural is 72 feet by 20 feet painted at Al Azhar University. One of the MAIA Mural Brigade’s goals is to raise funds for a purification unit. Art Forces recently was awarded a grant from the Sparkplug Foundation for the MAIA Media Project, which will provide support for the media amplification and contextual narrative research. 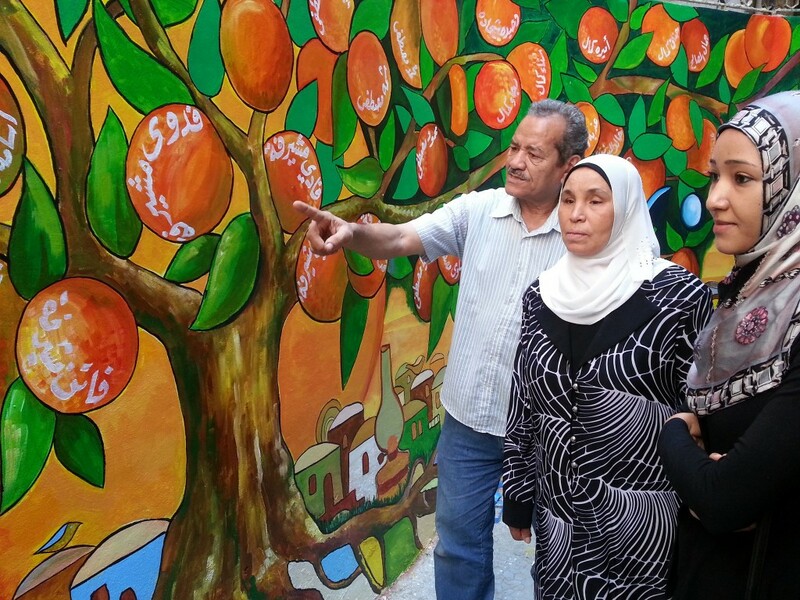 MAIA Mural/Media Project will work with Gaza Community Mental Health Programme to assess impact and measure outcomes. The psychosocial dynamic and dramatic life changes in the post 9/11 USA, with its broader implications internationally, and the psychological meanings of living in tumultuous political, economic and social conditions [give us] a traumatogenic globalized culture of crisis (Hollander, 2012). Levels of violence have increased in Occupied Palestine, and several generations of Palestinians have grown up as displaced refugees under the conditions of military occupation. The quality of life and infrastructure of Palestinian society erodes continually, along with the daily murder of civilians. Israeli society suffers from extreme militarism, internal contradictions of race and class, and the fear and results of deadly retaliation by Palestinians (B’tselem, 2003; Palestine Monitor, 2003; Hanoun, 2001; Said, 2002, 2003; Reinhart, 2002; Hass, 2002; Hoffman, Leiberman, 2002; Kimmerling, 2003, Hamzeh, 2001; Lockman, Beinin, 1989). The selected annotated literature review below looks what conditions are needed for a traumatic response to situations and how art and creativity play a role in building resilience. In the literature the recovery of trauma has always been described from a protective and supportive perspective. [In Palestine] the whole community, even the traditional sources of protection (e.g. parental authority) have been undermined. It is unknown how a recovery process develops under these circumstances (2005, Chapter 16). Trauma can refer to a traumatic event or circumstance and it can refer to a traumatic response or effect….It is important to distinguish these two because, contrary to the writings of many recent trauma theorists, traumatic circumstances to not always lead to traumatic effect, and calling them each a “trauma” can cause people to believe that they do. …it might be said that trauma results when there is a tearing of the integrity of the psycho-physiological or psycho-social system- and where that system cannot be psychically restored and/or energetically reasserted. But where strong reaction is possible or where a belief system is reasserted, trauma may well be averted. In order to make the past a useful present and presence, we need metaphors that capture the memorial activity linking the past with the present and future in a meaningful manner. Another aspect for many psychoanalytic writers is that trauma may be experienced passively and that the conversion to an active experience promotes a sense of mastery (Kris, 1952). According to Kris, creativity is often shaped by traumatic experience and that an important function of art is to convert a passively experienced trauma to an active experience. …to avoid trauma a person must react to the traumatic circumstance in an active way; a way in which previously held meanings are reasserted, energies are discharged, the social fabric rewoven and belief systems and practices are reinforced. Another important idea is that an active creative response to traumatic circumstances includes an ‘audience’ or ‘witness.’ Kris (1952) has stressed the importance of the audience to the artist. In Kris’ view the study of art is, to a great extent, the study of communication. Many who study trauma have found that in order to be treated, the subject needs to be seen and witnessed including finding a way witness to one’s own experience (Caruth, 1995; Herman, 1992). We have found that the therapeutic space in expressive arts therapy can provide a haven for the Palestinian people who live under constant trauma and fear, and can contribute to their healing process. Acting, moving, singing, art making and playing energize us as individuals and help us build a healthier community of people, even if it is only in the here and now. They remind us that such pleasure is possible and, therefore, that there is something hopeful to look forward to. The artistic response to trauma has as its most essential aim to allow the difficult questions to linger, even if unanswered. But this does not mean that the energy of the pain lingers, it is expressed interrogatively through the work of art itself.